6 Elements of Social Justice Ed. : Recycling! 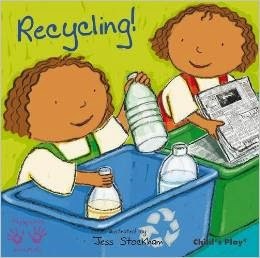 This book is geared towards teaching young children (3-5 year olds) how to reduce, reuse, and recycle (the three R's). The book is heavily focused on using illustrations to teach visually how to reduce, reuse, and recycle different items/materials. The words in the book explain in simple terms what the pictures are showing. The main characters are two children that are learning how to take action in protecting the Earth by helping their mother use less of some products, reuse some items (such as clothes and toys), and recycle household items into specific bins. The children also learn how to use left over food to create a compost pile. Because the body of this book is so picture based, the author provides information for the reader about what happens to the products that we recycle (glass, plastics, food and drink cartons, etc) on the final page. The author also explains the meanings of the words “reduce,” “re-use,” and “recycle” so that the read can gain a more concrete understanding of the concept. This book is teaching children how they can help protect the environment by reducing, re-using, and recycling. The way the book is written allows for a lot of outside discussion during and after reading it. For example, on one page the children are riding a bus with their mother and point out--“there’s a roof garden! And solar panels!” The book never goes on to explain further what solar panels are, but instead allows for the children reading the book to wonder and perhaps ask questions and start a conversation at home or at school. This technique of writing, not only teaches the readers how to help out the environment, but encourages them to start conversations and get others involved in protecting the Earth as well. This book would be a great introduction to teaching students how to take responsibility in protecting the environment on their own. I would start the lesson by having a discussion about the three R’s and ask the students how they are already involved in this social action. I would then introduce and read this book to the class as a way to teach more about the topic and to teach other ways that the students might help out with protecting the Earth. This book could be read once as a whole to get an overview of the ideas behind the book, and then each page could be used as a topic of discussion or potential project for the classroom. I would do an activity in which the class would save some food scraps for a school compost pile. I’d ask the students to save left over food from their lunch and perhaps even bring in some leftover food from home to create a compost. We could also designate some bins in the classroom and/or to divide up materials to be recycled (plastics bin, paper bin, glass bin, etc.). This book is published by Child’s Play. They publish a wide variety of books that are all geared toward child learning. Their website (www.childs-play.com) is listed on the bottom of the last back of the book (as well as in the "resources" link above) and can be used as a resources for finding other books or activities to incorporate in the classroom. They have a section of the website geared especially for teachers. The teachers section provides lesson plan ideas and information on other potentially helpful books for the classroom (they have a section dedicated to books on diversity and equality).